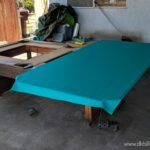 Keeping a covered patio pool table is fairly common here in Orange County. We are blessed with mild weather year round and use our outdoor spaces to entertain frequently. It is fun to have family and friends splashing in the pool, barbequing and shooting pool in the same area. 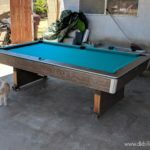 Backyard pool tables can be an excellent way to increase your fun. There are few things to keep in mind about having a pool table outside, however. Pool tables are pieces of furniture and while the stone pieces are fairly resilient, other pieces are not. Wood, rubber, leather and plastic age much quicker when exposed to the elements. A heavy duty fitted cover will help tremendously. It keeps dust and moisture off the cloth as well as protecting pockets and cushions from too much sunlight. 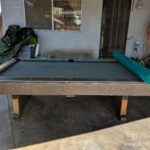 This one-piece slate pool table in Santa Ana, California has seen many summers of use. When I arrived at the location, I almost thought the table had steel grey felt. 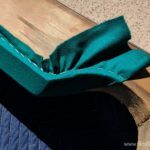 When I pulled up the corner of the tear (the telltale sign of cues needing repair), the standard green cloth gave a jolt of color to the table. 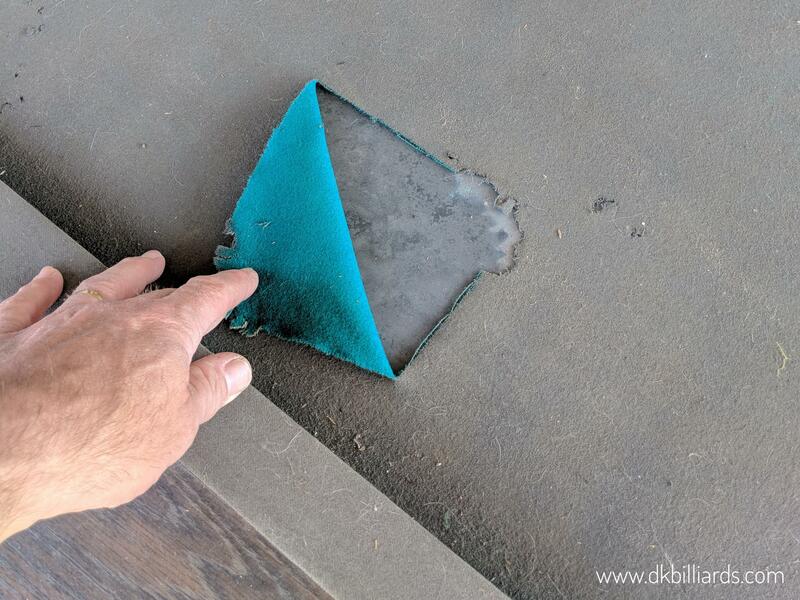 We got to work removing the uni-rail system and the one solid piece of slate from the frame. Uni-rails can be a bit tricky to work on, but luckily we had some extra space by the homeowner’s pool. 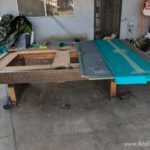 The brand new standard green cloth was glued to the slate bed. 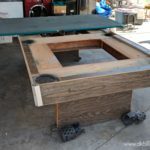 It’s always fun to breathe new life into a family’s pool table with a refelt service. The patio is now ready for upcoming family baptism and graduation celebrations.